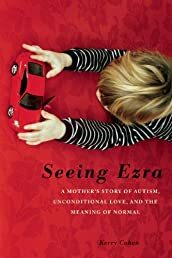 Seeing Ezra is the soulful, beautifully written memoir of a mother’s fierce love for her autistic son, and a poignant examination of what it means to be normal.” When Kerry Cohen’s son Ezra turns one, a babysitter suggests he may be different,” setting her family on a path in which autism dominates their world. As he becomes a toddler and they navigate the often rigid and prescriptive world of therapy, Cohen is unsettled by the evaluations they undergo: At home, Ezra is playfully expressive, sharing profound, touching moments of connection and intimacy with his mother and other family members, but in therapy he is pathologized, prodded to behave in ways that undermine his unique expression of autism. It soon becomes clear that more is at stake than just Ezra’s well-being; Cohen and her marriage are suffering as well. Ezra’s differentness, and the strain of pursuing varied therapies, takes a toll on the familyCohen’s husband grows depressed and she pursues an affairall as she tries to help others recognize and embrace Ezra’s uniqueness rather than force him to behave outside his comfort level. It isn’t until they abandon the expected, prescriptive notions about love, marriage, and individuality that they are able to come back together as two parents who fiercely love their little boy. Powerful and eye-opening, Seeing Ezra is an inspirational chronicle of a mother’s struggle to protect her son from a system that seeks to compartmentalize and fix” him, and of her journey toward accepting and valuing him for who he isjust as he is.